Comments: Comments Off on LeBron James has put serious pressure on the Timberwolves. LeBron James has put serious pressure on the Timberwolves. Monday we will discuss the return of LeBron James and all the ramifications of that move with David Kay of walterfootball.com 6PM EDT on News, Notes & Rumors on or https://fryingpansports.com/radio-show/. First let me say I am delighted that LeBron James, the best basketball player on earth, is coming back to the Cavs in the prime of his career. Now there is pressure on Pat Riley and the Heat. 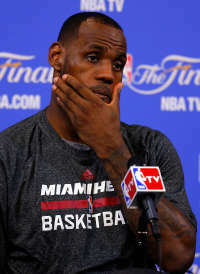 But LeBron also put serious pressure on the Timberwolves. Decision 2 has eliminated nearly all the possible trade options for the Timberkitties’ only asset—Kevin Love. It has also prevented any chance of a sign and trade with anyone other than the Cavs. Love wants to win a title and he has 0 chance to get that in Minnesota. He will only go to Cleveland. He will not sign an extension with any other team even if he is traded. Without a chance of an extension, Love’s value in a trade is badly reduced. No team will give up something like Andrew Wiggins for a rental player. So expect the Cavs to try to make a deal now and if it does not succeed at the trade deadline as well. It is in the best interest of both the Cavs and Timberkitties to work out a deal before the season. The Cavs need the cap space to bring in Love and the Timberkitties need to get something for a guy that will walk away at the end of the season. and perhaps SF Anthony Bennett plus a couple of 1st round picks. That is a deal the Cavs should jump on. The Heat are now 100-1 odds to win a title. Expect C Chris Bosh to sign a max deal with Houston and SG Dwyane Wade to return to Miami because he has no place else to go. Then we will really see just how smart Riley is at rebuilding a team. Don’t hold your breath for a comeback by the Heat.